`In Focus` – Learn 12 tips, tricks, licks and guitar lessons to become the ultimate guitar pro! Good guitar technique is the holy grail of guitar playing. It allows you to do the cool things that wow an audience, that makes the hair stand up on the back of their necks and get genuine heartfelt compliments from your loved one listening in the next room. As a minimum, good technique requires agile fingers, tight rhythm skills and good musicality. This is the least you need to play to a decent level. To play the more impressive things you generally need a fair bit more. Lessons on good technique are hard to find! Unfortunately, it is really hard to find the correct things to do on the guitar and time is something we all have a limited amount of. There is a lot of knowledge out there but finding the good stuff and separating it from the bad takes more time. 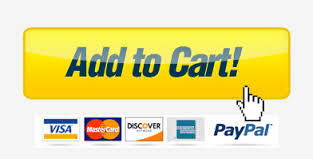 You can search the internet and YouTube for hours looking for good stuff to learn and the answers to your technical problems, or you can use a tried and tested resource from one of the world`s most respected guitar authors – Dan Thorpe. 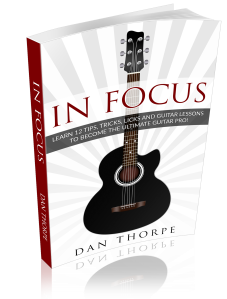 In Focus is a book that will help you fix issues, improve areas that need improving and add a new lease of life to your guitar playing. I get so many emails from students all over the world telling me a version of the following…. The above are all the things students have emailed me in the past regarding their guitar frustrations. Does ANY of the above ring true for you? If so, well, I have you covered, as the `In Focus` book covers ALL of those frustrations and more. In the book, I address the above in detail and give you a thorough and detailed lesson complete with audio, tab, and detailed notes on exactly how to improve those areas. In this book, you will find 12 chapters that are 12 lessons on different subjects all with the aim of improving specific areas of your guitar playing. It is mainly aimed at guitarists who enjoy fingerpicking and strumming their guitar and if you play acoustic guitar, that is most of you. Me personally, I find I get the most pleasure from doing both on the guitar. This book will help you improve both of those skills and so much more. Follow the advice in just one chapter and your playing will improve but follow the advice in all 12 and apply it to your general playing and you will find your guitar skills will massively improve on a larger scale. These 12 guitar lessons are what I have invented or adapted from others over the years. Whenever a student would get stuck on an issue – let`s say playing fancy chord embellishments that everyone oozes over (including me! ), I would create a lesson for that student to help them get past that hurdle. Then, when another student would hit the same hurdle (which would nearly always happen) I would bring out the same lesson again but naturally improve upon it from the last time. Over time I would teach the same lesson again and again and keep tweaking it so that it fixed their issue and made complete sense to them. I would do this while giving them something fun to play – and something they can add to their own daily playing. This book is much bigger and much more in-depth than any of my other eBooks. Each lesson is very detailed and this book is not for absolute beginners. It is a book that will take any bored, frustrated or stuck player to the next level. I want you to join me and learn from my vast knowledge, many years of teaching experience and my thousands of hours of playing. I want you to learn my most fun and exciting lessons that will help you reach the next level of your playing. This very in-depth eBook will absolutely, 100% positively change your guitar playing and if it doesn`t you have 90 days to get an instant, no questions asked refund. 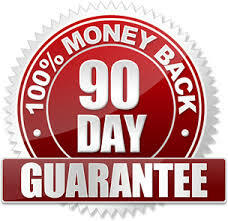 You will get a 100 percent money-back guarantee if you don’t feel this product has improved your whole guitar playing and helped you on the road to mastering these areas of the guitar.